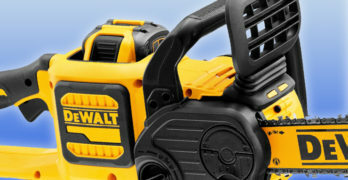 What’s the Quietest portable generator on the market? Everyone wants a whisper-quiet generator, and for good reason. Conventional generators are typically quite loud and can drive you crazy in a short amount of time. Personally, I think it’s worth the money to invest in a quiet generator. Yes, an inverter generator is more expensive but in the long-run, you won’t regret it. The generators we review in this article are quieter than a normal conversation. It’s absolutely amazing how quiet these generators are, especially the powerful Honda EU7000iS — a 7000W workhorse which operates at only 58dB at 100% load. If you think about that level of quiet, it truly is incredible. Intro | Quietest portable generator on the market? Quietest portable generators on the market? Attention grabbers, like whisper-quiet, super-quiet, or quietest, are used in many inverter generator articles and are actively discussed in conversations. What is quiet? Is a living room quiet? Sound levels are generally measured using the decibel scale. 30 dBA is very quiet, and 20 dBA is whisper quiet or similar to rustling leaves, but no generator is this quiet. The three generators we’ll be reviewing are all rated between 48 and 58 dBA at 25% of their rated power, from 23 feet away. That’s comparable to being close to a refrigerator or an air conditioner. Compared to conventional open style generators, it’s remarkably quiet. Open-style, non-inverter, generators typically range from 73 to 78 dBA. That’s 4 to 5 times louder than a 50 dBA generator. Without delving into the complexities of sound and noise levels and its measurement, it is safe to say that a 10 dB increase in noise will be is perceived by humans as roughly double in loudness. A 20 dB gain in noise is therefore roughly 4 times louder. The portable generators under review are quiet enough to be completely bearable, even when close to you. It’s as noisy as a modern car engine at idle from a distance. *Honda EU2200i — *Recalled : 2200W — 120V — 48 dB min. to 57 dB max. Honda EU7000iS : 7000W — 240V— 52 dB min to 58 dB max. Yes, all of them are quiet, portable, desirable inverter generators of an excellent quality standard. I will easily recommend them, but it boils down to your specific needs. Quietest Portable Generators on the Market? Recalled : Honda EU2200i, EU2200i Companion, EU2200i Camo, EB2200i — View PDF of the problem and additional details, such as the units affected. For an equally good alternative, I would highly recommend the new 2200W Yamaha EF2200iS — a 2200 watt inverter generator released in 2019. This is an excellent generator that is on par with the now recalled (and unavailable) Honda EU2200i. For now, stay away from this generator. Get the Yamaha. Learn more about the recall by visiting our dedicated review of the Honda EU2200i. Sorry Honda, you really messed it up. All links for this generator have been removed until the dust has settled and the new and improved design has been released. It might be awhile. The Honda EU2200i 2200-Watt 120-Volt portable inverter generator is the quietest of the three. With noise levels of 57 dBA at 100% power and 48 dBA at 25% power, you can easily have a conversation right next to the working generator. It’s powerful enough to support a range of appliances, and it’s also light enough to comfortably carry around. It’s perfect for portable use at home, camping, on the job site, or where ever power is required. This portable inverter generator can operate a wide variety of appliances up to a total of 1,800 Watts with a maximum of 2,200 Watts start-up power. It is perfect for camping, a large TV, tailgating, or as a food truck generator, and lots more. It’s so quiet that it will not interfere with conversations and it delivers clean power that does not harm a POS or entertainment system. The Honda EU2200i only delivers 120 Volts AC and 12 Volt DC. A 20A electronic protection circuit breaker protects the 120 Volt line that delivers power through two home-style sockets with a floating neutral. Meaning that the neutral wire does not connect to the frame or earth ground. By not bonding or referencing the neutral wire to earth, both legs on the receptacle are hot legs when measured between the frame and the pin. The 12V DC 8.3 Amp supply is intended for battery charging purposes only and you need an additional charging cord. I strongly advise that you consult an electrician if you want to change the generator’s configuration. The rules are not clear, there is even confusion amongst electricians, but they should at least know the local regulations. Also, keep in mind that generators sold in Canada have neutral bonded to the frame in compliance with CSA standards. The 20A electronic protection circuit allows the Honda inverter generator to deliver more than the usual 15 Amps to the 120 Volt receptacles to support startup currents. An overload indicator on the control panel may light up if the overload is shorter than 4 seconds, but the circuit will not cut the supply. 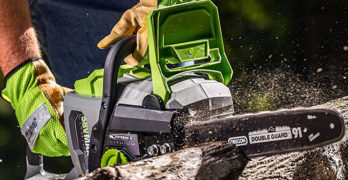 If you feel the 1,800-Watt power is not enough, you can connect the generator up with a second EU2200i for additional power. Two identical models connected in parallel, with an optional parallel cord, will deliver up to 3,600 Watts of continuous power. Fuel consumption for this portable generator is pleasantly low. When used with the Eco-Throttle System, the EU2200i delivers a fuel consumption of 6.06 kilowatt-hours per gallon. The higher the figure is, the better the generator performs. 5.1 kilowatt-hours per gallon is the average for 14 gas and propane generators that we compared. When compared to the Briggs & Stratton engines, the Honda engines are more advanced. The Briggs & Stratton engine of the P3000 only delivers 4.33 kilowatt-hours per gallon. The best performing of the three, is the Honda EU7000iS with a consumption of 7.01 kilowatt-hours per gallon. Which is excellent, it’s the best performer of all the generators I’ve evaluated to date. The Honda GXR120 Commercial Series engine powers the EU2200i portable generator. The engine was initially developed for heavy duty construction equipment. So you can expect superb durability and reliability from this 121 cc, 4-stroke engine. A fuel shut off valve allows you to shut the fuel supply with the engine running. This clears residual fuel from the fuel line, ensuring that no stale fuel accumulates during storage. Replacing the oil on this inverter generator is not a messy affair. The oil drains through the supplied openings without any spills, and you use a regular funnel to add oil. The EU2200i does not have an electric start feature. You have to pull the recoil rope to start the engine. This makes the automatic mechanical decompressor system fitted to the engine particularly welcome. It significantly reduces the amount of force needed to start the engine, it starts effortlessly on the first pull. The elimination of a heavy electrical starter and battery has the advantage of making the generator incredibly light and portable. It weighs less than 47 pounds, making it easy to carry and pack away for storage. A stamped metal insert for the recoil rope reduces the possibility of damage to the generator body. Another built-in protection feature is the Oil Alert system that shuts the engine off when a low oil level is detected. The environment is also protected by a USDA conforming spark arrestor. Honda’s inverter technology is advanced and delivers stable, clean power. Its modern design ensures that it is smaller and lighter than most inverters. The Honda inverter is precisely controlled to ensure that its power is as clean and reliable as the power you use at home. Oil changes have been improved by a large spout and oil drain gutter. Honda engines are certified for regular unleaded gasoline. However, E85 (a mixture of 85% ethanol and 15% gasoline) is not regular gasoline. It’s an alternative fuel, and you must not use it for this generator. Powered by the Honda GXR120 Commercial Series engine. A 3-year residential and commercial warranty covers the generator. Being a DIY person myself, I found it interesting that you can purchase workshop manuals from Honda Power Equipment’s Amazon Store. I’m disappointed to see that rubber covers do not protect the outlets of this inverter generator. It keeps them clean and protects small children who may be tempted to insert things. Another problem is that the connections may become contaminated by dust and moisture that can create a non-conductive layer. It creates resistance to current flow and which may cause a failure. I’ve experienced this before. Now I use outlet plug covers, sold as childproof safety caps. If you live in a dusty environment, or plan to use your Honda inverter generator in dusty conditions, I suggest you use them. 240 Volt. — 52 dBA min to 58 dBA max. Powerful, quiet and clean energy. Perfect! 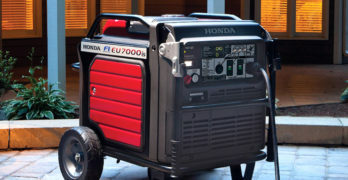 The Honda EU7000iS fuel injected gas generator delivers 7,000 starting watts, and 5,500-Watts running power. Not only is it the biggest inverter generator in our lineup, but the only one that delivers 120 Volts and 240 Volts. It’s the only one with an electric start. Also, to top it all, it’s the most fuel efficient of them all. You can double the power by connecting two EU7000iS’ with the optional parallel kit. The size and clean power are perfect for home backup power, powering an RV, for outdoor events, and more. It has two dual 20 Amp GFCI (ground fault circuit interrupter) protectors. This is the only way to protect people from an electric shock. It detects the difference between the current leaving and returning through the current transformer of the GFCI protection device. If the current exceeds 5mA, the solid-state circuitry opens the contacts to de-energize the circuit. A 30A 125V locking plug, and 30A 125/250V locking plug complete the AC receptacle circuits. It has an additional USB outlet for charging your cell-phones. This quiet portable generator delivers its full 5,500 running watts power, with a noise level of at 58 dBA. At 1/4 load it’s quieter, only 52 dBA. The Honda generator is not only quiet, but almost free of vibrations. It easily holds a glass of water without even showing ripples, and spills nothing as it cycles to full power and back. The Honda engine is a fully balanced 389cc, fuel injected engine, driving a quality generator that delivers this remarkable performance. The elegant sound-damping covers contribute to the low sound levels. The Electronic fuel injection technology offers better fuel efficiency and lower maintenance. It also eliminates the need for a choke, so there is less to go wrong. The elimination of a carburetor reduces fuel associated problems because the fuel in the lines is not exposed to air. And of course, the Honda GX390 engine is reliable, designed for long life and superior performance. A fuel gauge lets you check the fuel level while the generator is running. The convenient electric start button starts the engine effortlessly, but it refuses to do so if the oil level is low. It displays a warning message on the i-Monitor liquid crystal display, indicating that it needs oil. On a full tank of 5.1 gallons, it runs for 18 hours at a ¼ load. At 5,500 Watts, it should run for 6.5 hours. Its fuel consumption at full power is, therefore, a remarkable 7.01 kilowatt-hours per gallon. The Honda EU7000i inverter generator is fitted with an Eco-Throttle System, a switch allowing for automatic adjustment of the engine speed in relation to the power requirement. Traditional generators run at 3600 RPM to produce the required 60-hertz. However, inverter generators with an Eco-Throttle can safely reduce the engine speed whilst maintaining frequency and power using the inverter. The Eco-Throttle load-dependent speed control automatically selects the optimal engine speed. Because the engine speed is varied to suit the load, Eco-Throttle reduces fuel consumption by up to 40%. This explains the excellent fuel consumption figures. It also reduces the noise level because the engine is not running at full speed constantly. Which in turn, helps reduce exhaust emissions. Replacing the oil on this generator is as easy as possible. Draining the oil from the Honda works nicely through the supplied openings. A standard funnel works perfectly for adding oil to the Honda. Honda’s inverter technology means stable, clean power for computers and other sensitive equipment. The EU7000iS can operate a wide variety of appliances, making it perfect for portable use at home, camping, or much more. The precision of Honda’s inverter technology ensures that their inverter generators produce power that is as reliable as the power you get from your outlets at home. The inverter technology also ensures in a smaller, lighter package. The EU7000iS portable generator has convenient handles that can be raised for transport and lowered for more compact storage. The two solid rubber wheels make moving the heavy, 261.5-pound generator more convenient. The i-Monitor system tracks running hours, current RPM, starter battery volts, and the current wattage delivered at the outlet. It also gives diagnostic feedback for any problems, making for convenient dealer servicing. A switch on the control panel lets you choose between using both 120 and 240 Volts, or 120 Volts only. This switch allows the total generator output to be available through the 30 Amp 120 Volt locking outlet. It enables you to power units with more substantial wattage requirements like a 120 Volt 30 Amp RV. Electronic circuit breakers protect the generator against overloads. Honda offers a 3-year residential and commercial warranty on the EU7000iS, and another comforter is the USDA-qualified spark arrestor muffler that’s fitted. Run two in parallel and almost double the power output. PowerSmart Series Technology Inverter technology produces quiet, consistent power for your RV, small business, tailgate or even home backup. Quiet, Efficient Power The P3000’s quiet inverter technology provides smooth, stable power safe for sensitive electronics. Its engine speed adjusts automatically, further reducing noise, fuel consumption, and emissions. LCD Statstation Display The easy-to-read LCD screen shows the amount of power being used, total unit hours, and maintenance reminders, including oil, air filter, and spark plug changes. Easy Mobility A unique twin handle design and luggage-style telescoping handle make mobility a breeze. Parallel Connector Port Lets you connect two units together for even more power – perfect for RVs with air conditioning units. Parallel connector kit sold separately. Multi-Featured Control Panel Includes four 120V household outlets, one 120V, 30A locking outlet, a USB port and a 12V DC battery charging outlet for powering lights, radio, TV, small appliances, laptop/tablets, cell phones an RV and more. Fuel Sight Gauge Conveniently displays how much fuel is left. The Briggs & Stratton P3000 3,000 Watt, 120 Volt portable inverter generator is an interesting variation on the Honda inverter generators. It’s virtually the same price as the Honda EU2200i. Both deliver 120 Volts only, and both do not have electric starters. The Honda inverter delivers 1,800 Watts running power and the Briggs & Stratton 2,600 Watts, 800 Watts more for roughly the same money. It begs the question: which one is the better buy? The answer is not a simple one. We need to compare more than the price-performance relationship of these inverter generators. The fuel consumption of the Honda EU2200i is better than the Briggs & Stratton. 6.06 compared to 4.33 kilowatt-hours per gallon, which says the Honda is cheaper to use than the Briggs & Stratton. The Briggs & Stratton engine is not very fuel efficient and below our average of 5.27 kilowatt-hours per gallon. The fuel tank on the Briggs & Stratton inverter generator is bigger than the Honda’s. Therefore you should get roughly 2.47 hours runtime at its full running watts of 2600 Watts and up to 10 hours at 1/4 Load. The 1/4 Load figure is rather meaningless because no-one will buy this expensive inverter generator to use 650 Watts. Your real runtime may be somewhere in between but closer to 3 hours than 10. The Honda is quieter than the Briggs & Stratton which produces a decibel reading of 58 at 25% load. It’s therefore measured at reduced engine speed while the Honda is measured at 100% power and produces 57 dBA. Feedback generally stated that it is loud when fully loaded. It’s not bad though, a lot better than a regular generator. For convenience, the Briggs & Stratton beats the Honda. It has four household outlets compared to the two on the Honda. Both have a 12 Volt DC outlet for charging automotive style batteries, but the amperage of the Honda is higher. Briggs & Stratton also offers a USB port as a convenient way of charging USB devices. The final blow from the Briggs & Stratton is the one 120-volt 30-amp RV adaptor which the Honda does not have. It is what separates the two. The Honda is a lightweight, quiet camping-generator, while the Briggs & Stratton inverter generator offers more. More power, more outlets, and more adaptable. The Honda will have a hard time partially supporting an RV, and you will have to use an adapter to match the two. The Briggs & Stratton is RV ready with its outlet, and it has enough power to run a 13,500 BTU air conditioner. However, you can’t power anything of significance, like a microwave oven or coffee maker at the same time. A customer reported that his P3000 runs a 13,500BTU air conditioner on high using 47% power, leaving plenty of power for the TV and surround sound system. A word of warning is needed here. Not all air conditioners are equal. You must do some homework to determine if the 3,000 starting and 2,600 running watts power will support your air conditioner. Some older units may not run or may consume most of the power. Also, make sure you use the round 30 Amp receptacle. The 120 Volt duplex receptacles cannot support the air conditioner. As can be expected for an inverter generator, a dedicated parallel connector port allows you to connect two PowerSmart Series inverter generators. It will then support most RV needs, if not all. Both the Honda and Briggs & Stratton generators are portable inverter generators that deliver clean, regulated power. However, the Honda is more portable than the P3000. To compensate for this, the Briggs & Stratton has a neat telescopic luggage-style retractable handle and two 6″ Solid wheels. Making it easy to move the machine around. For loading it, two sturdy handles on top, simplify lifting the 85 pounds weight. With a little help from your friends. The P3000 PowerSmart Series inverter generator is more of a general all-round generator because of its additional power and convenient outlets. Ideal for 120 Volt RV camping, tailgating, and for DIY projects anywhere you need power. The handy StatStation LCD Display provides vital performance stats and maintenance reminders. It shows the amount of power used, total unit hours and maintenance reminders, including oil, air filter, and spark plug changes. Another advantage over the Honda, is that the P3000 has covers for all the outlets that protect them against humidity and dust. The P3000 Quiet Power technology also offers the ability to flip a switch, which automatically adjusts engine speed to reduce noise, save fuel, and run for longer. On all the inverter generators it is the normal position, the need to run the generator at constant full power only arises with cycling loads like air conditioners. The P3000 PowerSmart series inverter generators cannot ship to the state of California because the Briggs & Stratton OHV, engine doesn’t meet CARB requirements. To start this engine, you have to open the fuel shut-off valve, close the manual choke and use the cord to yank the engine to life. You do not have the convenience of fuel injection, and electric start like the big Honda inverter does. Fortunately, it starts quickly. Draining oil on the Briggs & Stratton portable generator is not as pleasant as on the Honda generators. There is no drain plug at the bottom and customers reported that you have to turn the generator on its side to drain the oil. Which also means that you have to drain the fuel to avoid a fuel spill. If you find yourself relying on the generator for months due to a disaster, this could become annoying. 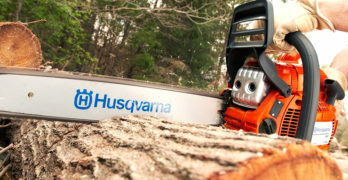 Summary | What’s the Quietest Portable Generator on the Market? The Honda EU7000iS is in a class of its own because it is the only 240 Volt generator reviewed. 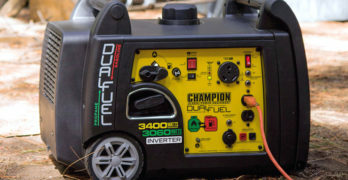 It is a capable inverter generator that pushes fuel efficiency to new levels. It is the quietest 7,000 Watt portable generator, and all the user feedback is positive. This generator is easy to recommend. You will not be disappointed. The smaller iEU2200i inverter generator from Honda is not comparable in output to the Briggs & Stratton. As a lightweight, capable, and fuel efficient portable inverter generator, the Honda EU2200i cannot be beaten. It’s spooky quiet, making it a perfect camping generator. If you are in the market for a generator of this size, you need not hesitate. The commercial engine is well respected for its reliability, and user reviews are all positive and enthusiastic. The Briggs & Stratton P3000 Inverter generator is a capable generator, compatible with a 120 Volt RV. The Honda generators are quieter than the P3000, and the Briggs & Stratton has some disappointing flaws in its design. However, it is a capable generator that will satisfy most needs. Despite a loyal following, not all user reviews are positive. The Briggs & Stratton would not be my first choice. Its fuel consumption is a bit high for my liking.